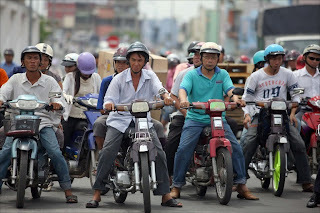 Whilst not the capital of Vietnam, Ho Chi Minh City can boast to being the largest and, arguably, the most significant. It eminates an incredible energy and has constant activity flying around you along with the humdrum you would expect of a huge metropolis. For backpackers visiting the city the most important thing is to avoid being fazed when faced with this seemingly uncoordinaated, sprawling monster. When you acclimatise to its many oddities you will see it is a wonderous destination and one hard not to fall in love with. The first thing to remember is to look both ways before you cross the road. Or the pavement. Or anything for that matter! With a population of over 9 million people there’s no space to move and it seems like every one of those people rides a motorbike. If you went up in a plane above the city you could be forgiven for thinking it was a swarm of flies! And it’s not just people that are rife, attractions are abundant around the city too. Choose from the Chu Chi tunnels, Thong Nhat Palace or one of the many beautiful pagodas dotted around. As you’d expect from a city so steeped in history there’s also a healthy amount of museums, of which the Ho Chi Minh Campaign Museum is the stand out in my opinion. But the great thing about this backpacking destination is that you don’t need the attractions to visit, the culture and the people are enough on their own. You could sit on a bench and watch the world go by on their motorbikes for a lifetime without getting bored. And that is exactly what many of the backpackers who visit the city do. Backpacker accommodation is easy to come by as is scrumptious food at prices way cheaper (and tastier) than your local Tesco.